MainAll NewsIn Other News...Why Did a Saudi Plane Land in Israel? Why Did a Saudi Plane Land in Israel? Saudi Airlines plane lands overnight in Ben-Gurion due to technical difficulties, despite lack of official diplomatic relations with Israel. A Saudi Airlines passenger Airbus landed overnight Wednesday at Ben-Gurion airport, despite a lack of formal diplomatic relations between the two countries and Riyadh's refusal to recognize Israel's existence. The plane, an Airbus A330-300, had landed in Israel due to a technical issue with the plane after departing from Brussels, according to Yediot Aharonot. The plane was empty of passengers and appeared to be on a return flight to one of the airline's hub cities. The Israel Airport Industries (IAI) checked the plane without incident, although Ben-Gurion airport officials admitted to the daily that they were shocked to see the plane on the tarmac. 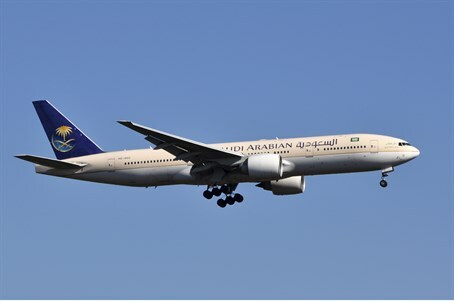 IAI stated Wednesday that the plane underwent "routine maintenance" and that the plane belongs to a European airline that leased the aircraft to Saudi Airlines. Saudi Airlines is Saudi Arabia's flagship carrier; its main operations center is in Jeddah. The airline also operates hubs in Riyadh and Damam. Royal Jordanian and Turkish Airlines are the only Middle Eastern flagship carrier currently operating to and from Ben-Gurion airport.